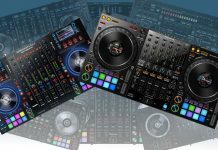 There are many really cheap DJ controllers on the market, and if you are on a very, very tight budget, the choice might be a bit overwhelming. In this feature, we try to single out the best DJ controllers for less than 150 dollars. For that price, some concessions have to be made. Don’t expect full-blown mixers with faders and EQ sections, or built-in sound cards by default. Jog wheels will be usable at best. 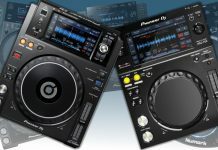 But if you are starting out and want to get a taste of DJing, or your kid wants to be the next Hardwell, buying an ultra cheap controller could be the best solution. On the other hand, if you are a professional DJ, having a small, cheap controller as a backup unit could be a good idea as well. Bottomline: Very small and cheap Serato controller with built-in audio interface. Very cheap and very compact. Very basic mixer missing any EQ’s or line faders. No pitch faders or effects controls. 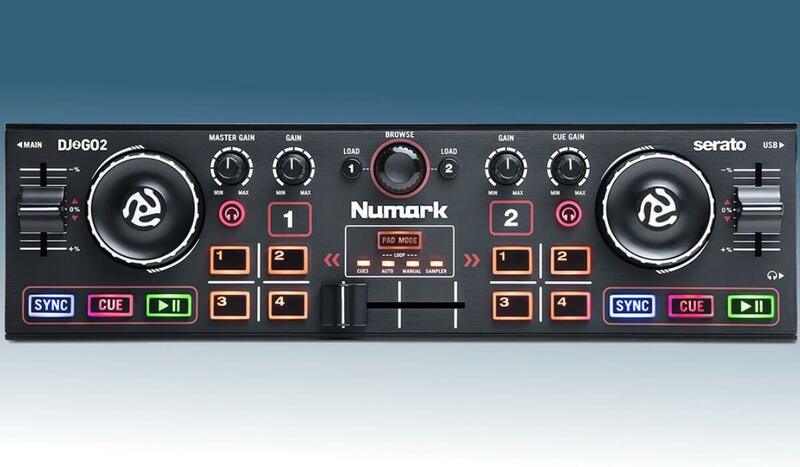 The DJ2GO2 is the newest entry-level DJ controller from Numark. It’s compact enough to fit on your laptop, support Serato and has a built-in audio interface. The jog wheels are tiny and probably not useful beyond track searching, but having them is a plus. The 4 pads per deck control cues, loops (manual and auto) and samples, leaving out effects control. There are no EQ’s, pitch faders or line faders, allowing for not more than basic mixing. The compact size and the built-in audio interface make it an ideal backup controller for Serato DJ’s and for those beginner DJ’s that want to smallest solution possible. Bottomline: Compact and cheap, but well featured DJ controller for DJUCED 40°. Hercules is the king of compact, entry-level controllers, and the DJControl Instinct P8 is certainly an interesting addition. The most impressive feature are the 8 performance pads, that can trigger hot cues, effects, samples and loops, including loop rolls. The jog wheels aren’t touch capacitive as they are on more expensive controllers, and that means that you need to press down hard to, for example, stop a track. On the plus side, they double as pitch faders using the shift button. Apart from all that, the DJControl Instinct P8 does have a built-in soundcard, which is remarkable for the asking price. Bottomline: Compact and cheap Serato controller, with hardware mixer and built-in effects module. Hardware mixer in a sub 100 dollar controller! Supports Serato DJ Intro and Serato DJ. No real physical jog wheels. No easy way to know which effect is active from the tiny screen. 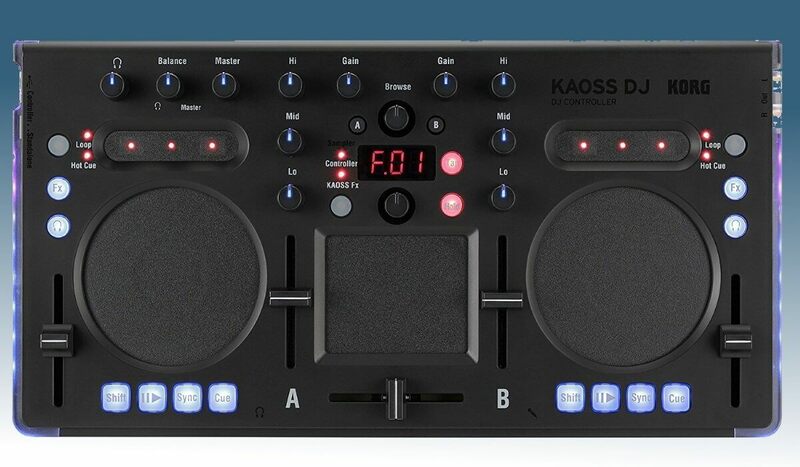 The Korg KAOSS DJ is very interesting little DJ controller. It’s not exactly for beginners, although it’s not difficult to use and support Serato DJ Intro, which is free to use. The reason this is not really a beginners DJ controller is the heavy focus on effects, as this controller is heavily inspired by Korg’s Kaossilator series. It has 120 built-in effects controlled by the X/Y pad. The controller has, surprisingly enough, a hardware mixer, so you can connect external audio sources and use them with the mixer and the built-in effects. The Korg KAOSS DJ has no real jog wheels, but the touchpad jogs work just fine. Each channel has a 3 band EQ, loop and cue’s controls, and a clear transport control section. All the knobs have a led built-in to indicate central position, which is handy in a dark club. Bottomline: Easy to use beginner DJ controller with built-in light show. 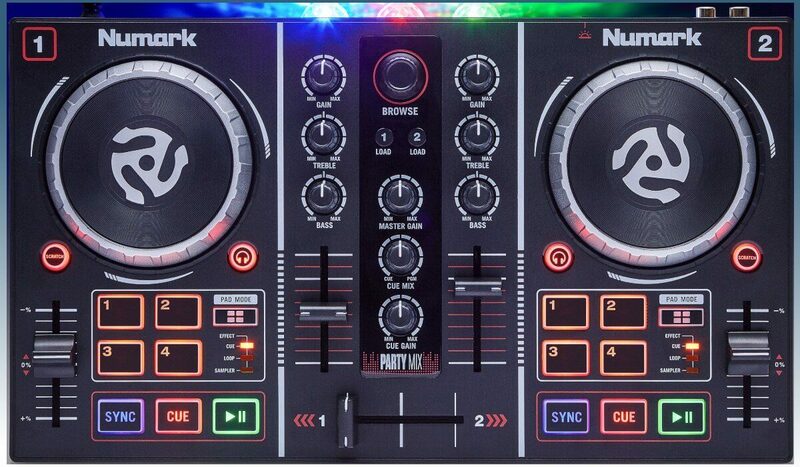 The Numark Party Mix has a very traditional layout and is quite easy to use. There are 2 small jog wheels that are usable at best, and 4 pads that control 4 different functions: effects, cues, loops, and samples. The mixer has a 2 band EQ with gain control, remarkable for a sub 100 dollar controller. The big selling point of the Party Mix is its built-in light show, that can be set to different patterns. 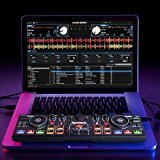 Overall the Party Mix is a nice starter controller and with the support for Virtual DJ LE it works with a popular software package. Bottomline: Small, cheap but still very usable. performance pads unlock different functions. Mappings for Virtual DJ and Traktor available online. No pitch fader or line faders. The Hercules DJControl Compact is very small and portable. It actually fits right on your laptop. It has two small jog wheels, a 2 band EQ and 4 pads that unlock different functions: Loop, FX, Sample, and Cue. There is no built-in sound card and the software of choice is DJuced, which works fine and you can get mappings for Traktor and Virtual DJ online. 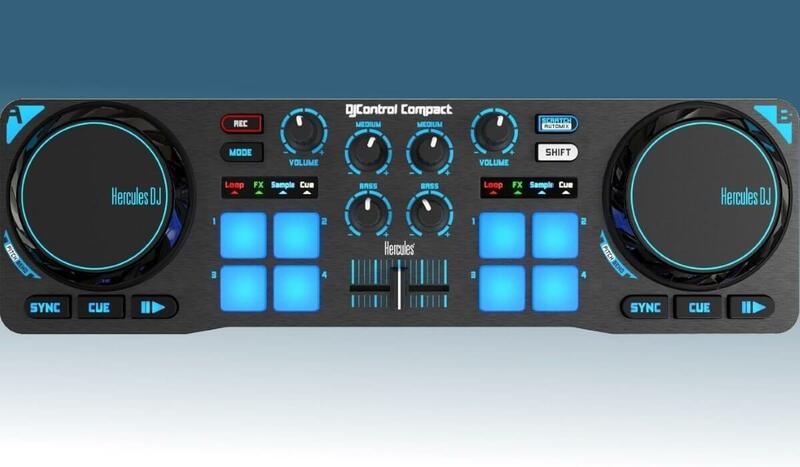 The DJControl Compact is a really good to start out with, and it’s also a great compact backup/training controller. Bottomline: Very compact and affordable, with large jog wheels. Performance pads that support many functions. No possible to set or call hot cues. AIR controls a bit of a gimmick. 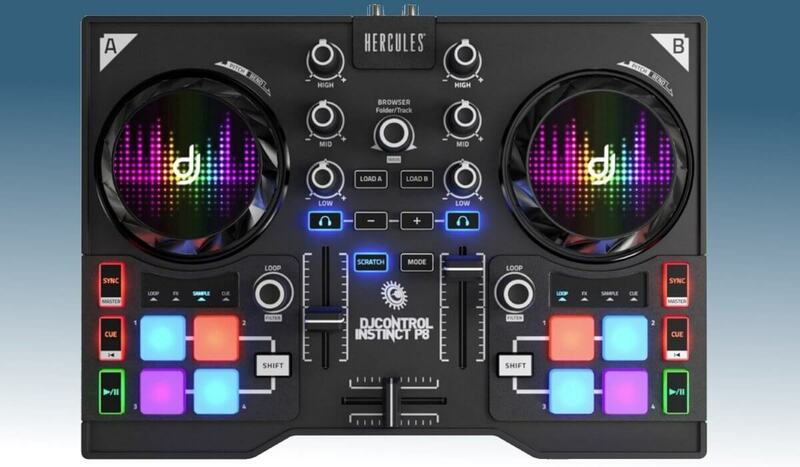 The Hercules DJControl Air S is an interesting and rather complete DJ controller from Hercules, with all you need to get the mix going. It has an onboard sound card, a 3 band EQ and AIR controls to manipulate your mix without touching the controller. The jog wheels are large and should be fine for scratch enthusiast, and there are 4 performance pads on board that performs different functions (FX, loops, and samples). 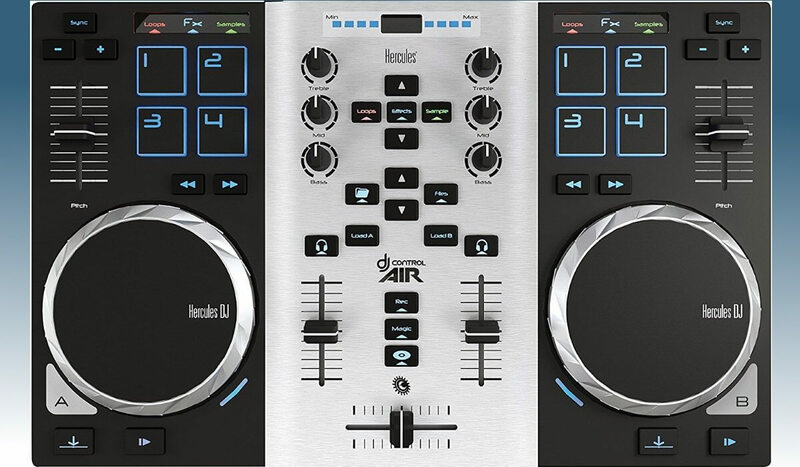 Overall the DJControl Air S is very simple to use and should get anyone that wants to start DJing mixing fast. The controller comes with Djuced 18, Hercules in-house software for beginners. Bottomline: very well equipped Virtual DJ LE controller, ideal for the beginner. 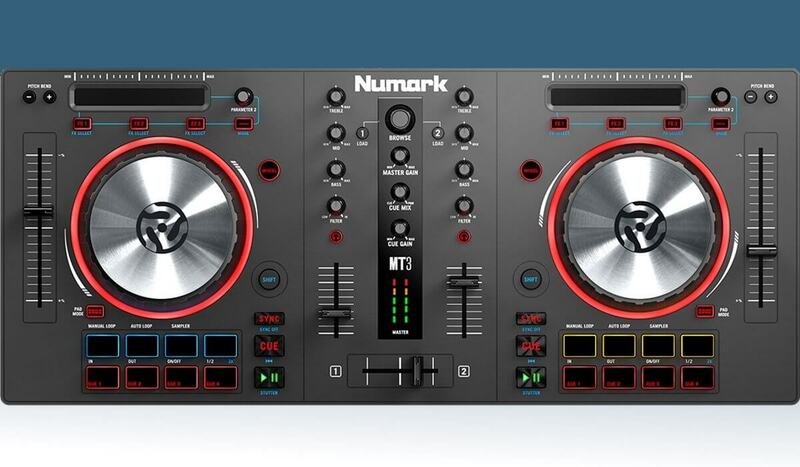 The Numark Mixtrack 3 is actually a very well equipped DJ controller, apart from the fact it doesn’t have a built-in sound card. (The Mixtrack Pro 3 has that and works with Serato DJ Intro, but costs close to 200 USD). The Mixtrack 3 has very well finished and large aluminum jog wheels, and above all, a long throw pitch fader, which are 2 things that are critical for good DJing. The top pads have 3 functions: manual loop, auto loop, and sampler. The bottom pads store hot cues, 4 in total. Finally, there are buttons to activate effects and a touch strip to manipulate the effect. *Price ranges: In order to avoid showing incorrect price ranges for the gear discussed, we work with price ranges. Click on the “check current price” link to find out the current price on Amazon.com at any time.